Excellent service, help with Cb antenna questions, low prices, repair, warranty, tuning and fast world wide shipping on the latest Wilson Cb antennas. On this page you will find FGT fiberglass Wilson antennas, SuperFlex Wilson Cb Antennas, Wilson magnet mount Cb antennas, Wilson trunk mount Cb antennas, roof mount Wilson Cb antennas and the popular Wilson 2000 Trucker Cb antennas. 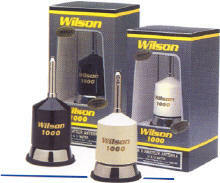 On the View Detail page of each Wilson antenna you will find available options for assorted lengths and colors. For Cb antenna mounts, parts and base antennas go back to the main Cb Antenna page near the bottom of the list. I will touch on some useful antenna information below to help at least point you in the right direction in your antenna choice. I will be adding more information to other pages and items throughout the webiste. We recommend using a single Cb antenna mounted "in the clear", meaning no tall adjacent objects within 4 feet of the Cb antenna. Longer Cb antennas will work much better than shorter Cb antennas. We recommend using a single 4 foot or longer Cb antenna when possible. Cb antennas work best when mounted directly to a flat metal surface like a roof or trunk. The metal surface forms the "ground plane". This metal surface acts as half of the Cb antenna. Truck mirrors can also make a fair ground plane as long as they are electrically connected (grounded) to the frame of the vehicle. For cars and other 4 wheeled vehicles a Wilson magnet mount antenna, trunk mount antenna or roof mount antenna placed in the center of the roof or trunk works very well. Note: High power 10 meter radios 80 watts and more require a solid "metal to metal" ground connection between the mount and metal surface. A poor ground with high RF (Radio Frequency) Power can cause squealing, humming, feedback and other problems. A magnetic mount antenna does achieve some ground thru the paint, called "inductive grounding". This is achieved by the magnetic lines of force carrying current through the metal surface. This is often not a sufficient ground for very high power radios. Fiberglass or steel whip? Fiberglass antennas have a higher wavelength because the coil is at the top of the antenna. This can give some increase in range. Steel whip antennas are much more flexible and durable. If you are going to be hitting trees and other objects I would recommend the steel Cb antennas. Steel whip antennas also have less wind resistance so a magnetic mount steel whip Cb antenna will not blow off in high wind. The thinner diameter whip also makes them less visible. Wilson fiberglass antennas will catch the wind worse due to the larger diameter. We have five inch magnet mounts that will hold up to a four foot fiberglass antenna. For fiberglass Cb antennas over four feet you would need our tripod magnet mount to keep it from blowing off. 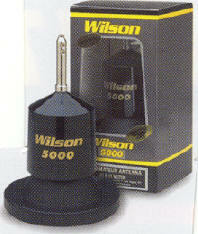 For the truckers we have the popular Wilson 2000 Trucker antennas on this page. This is a long time favorite of truckers and a very durable Cb antenna. We recommend a single Wilson antenna mounted to one of your mirrors when possible. This is one of the few locations where the antenna can be mounted "in the clear". Mounting to mirrors is getting more difficult as more trucks are being made with plastic mirrors. There are some special mounting options for some truck models. See our Cb antenna mount page. Note: Many factory antenna systems in 18 wheelers do not work well at all. If you have the system that uses a splitter box to run your AM/FM stereo on the cb antenna I would recommend bypassing the whole thing. If you do not see an AM/FM radio antenna on your truck you may have this type of system. This is especially problematic for high power radios. Another factory antenna system that has inherent problems is the type that is mounted high up to each side of a fiberglass cab, usually a dual antenna system. There is just not enough metal surface under the antenna to form a good ground plane. I recommend bypassing this and installing your own antenna system. For pick-up trucks a single magnet mount Wilson Cb antenna or roof mount Wilson Cb antenna placed in the center of the roof works best. Mounting dual Cb antennas behind the cab may look cool but it does not function well at all. The cab of the truck reflects and blocks the antenna signal and may make it near impossible to get a good SWR match. A Wilson 1000 or Wilson 5000, magnet mount or roof mount works great. The roof mount is better for high power radios. Motor homes and other "box shaped" fiberglass vehicles can be very difficult to get a Cb antenna to function well on. It is difficult to find a mounting location to where the vehicle body is not adjacent to the Cb antenna. Cb antennas must be mounted "in the clear" to work well. Mounting a long antenna on the roof of a motor home is usually not an option. Sometimes you can mount a Cb antenna high up on a mirror or high up on a metal ladder. I would suggest seeking the assistance of a local Cb radio shop. For other vehicles: Sometimes you have to get creative with installing Cb antennas. Some people even fabricate their own antenna mount or modify an existing mount. I do not list antenna packages or kits. It is difficult to put together a "one kit fits all" solution. Most often everyone requires various Cb antenna mounts, antenna lengths and coax cable lengths. Getting a Cb antenna to work well can often involve a lot of "trial and error". Sometimes it best to get hands-on help from a local Cb shop. Antenna Tuning: Cb antennas must be tuned to the vehicle. Yes, "to the vehicle". The antenna does not tune to the radio as many people believe. When matching a Cb antenna you are tuning it with the metal surface and frame of the vehicle. The vehicle acts as half of the antenna, the ground plane. Once your Cb antenna is tuned to that vehicle you can hook any cb radio up to it. The process of matching the antenna to the ground surface is called Standing Wave Ratio or SWR. This can be very simple or very difficult to achieve. Some antennas like Francis are "pre-tuned" to work with around 60% of vehicles depending on many variables. If they work, great!! They are easy and inexpensive. If they do not match your vehicle you just have to scrap it and get a tunable antenna. There will be more information on the Francis page later. I would recommend a tunable Cb antenna. All of our antennas with the exception of Francis antennas are tunable. Steel whip antennas have a wider tuning range than fiberglass. Some antennas have a wider bandwidth or frequency coverage, they cover more channels. Longer antennas have more bandwidth and are a better all around choice if you do not have a height restriction. You can expect around one to two mile of range for every foot (.3 meters) of antenna you have. A one foot antenna will reach 1-2 miles, a 5 foot antenna around 5-7 miles or more. Some cb radios have a built in SWR meter. These are ok but not always accurate. I would recommend getting a low cost SWR meter and a three foot coax cable jumper to set the antenna. You can find these on our SWR meter page in the left menu. As for coaxial cable we carry RG8x/RG59U also called "mini 8". This is very high quality mobile coaxial cable. Length is not important. Use what you need to get from your radio to the antenna. Do not coil up a lot of excess cable. We also carry mini 8 with screw on PL259 connectors called EZ cable. This is nice for threading thru mirrors and other small spaces. **ORDERING TIP FOR CB ANTENNAS: Shipping cost per item drops substantially as you as you add more items to a single order.. Example: 2 mobile radios only cost $4 to $7 more to ship than one radio. Adding an antenna with a radio often only ads $3 to $5 to the shipping cost. Bundling 1-6 antennas may only add zero dollars to a few dollars to the shipping cost. Shipping cost may be a little higher for Cb antennas over 60 inches length. when you see "OS Shipping" on an item it means Over Sized shipping. Unless you are shipping to an APO/FPO box some Cb antennas over 60 inches can not be shipped outside the 50 U.S. at a reasonable cost. These Cb antennas are marked as "OS Shipping". If you order several oversized antennas at once we may have to amend the shipping cost down by hand after your order is placed. Other than that most all shipping calculations are correct. You can save some money on shipping by ordering everything you need on one order. The more you put on one order the less shipping you pay per item. Shipping cost does not increase much for several Cb antennas that ship together. *The Wilson 2000 Trucker's higher gain performance is a result of several new design developments in Wilson Cb antennas that bring you the most powerful center loaded Cb antennas available in its price range. *Specify color and bottom shaft length after clicking "add to cart" or "View Detail". 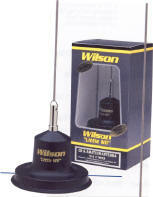 The Wilson 5000 Trucker CB antenna was shown to have the highest "Q" rating of all antenna coils tested. The "Q" is the standard engineering measurement of efficiency of the antenna coil. The higher the "Q", the higher the efficiency, which means higher performance from that antenna. The "Little Wil" uses Wilson's exclusive low loss coil design and is patterned after the proven performance of the Wilson 1000 and 500. The "Little Wil" out performs all similar types of small base loaded antennas. It was designed specifically for users who want a high performance antenna with a short whip, at a low price. 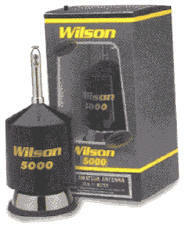 Wilson 5000 magnet mount Cb antenna. The Wilson magnet mount Cb antenna line is our top selling mag mt antenna. Wilson antennas work best placed in the center of the roof. Roof mount Cb antennas like the Wilson 1000 Cb antenna are typically mounted by drilling a 5/8 hole in the center of the vehicles roof or trunk. Roof mounting will provide and more circular output wave pattern giving better coverage in all directions as opposed to mouting a Cb antenna to one end or one corner of the vehicle. The metal to metal connection between the mount and roof on a Wislon roof mount antenna will provide an excellent ground for high power equipment. Excellent service, low prices, fast world wide shipping. Wilson Cb antenna FGT2', Wilson Cb antenna FGT3', Wilson Cb antenna FGT4' and Wilson Cb antenna FGT5' fiberglass antennas. Duriable fiberglass whips. The FGT Wilson antennas have a short tuning rod at the top to adjust the SWR. 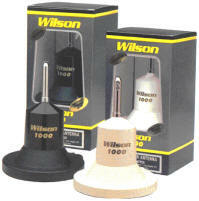 Tuning instructions are included with the Wilson FGT's. You may also need a low cost SWR meter and 3' coax jumper to check the Wilson FGT Cb antenna with. *Click "View Detail" for price and color options. Wilson SuperFlex Cb Antennas - Wilson Super Flex Excellent service, lowest prices fast world wide shipping. SuperFlex Wilson Cb antennas are the most flexible fiberglass Cb antennas on the market. Adjustable rod in the tip of the Super Flex Wilson antennas allow for easy adjustment of the SWR. *The wire at the base raises or lowers the SWR when connected to the mount (ground). It is often not used. *Update Feb 2014: The Wilson SuperFlex Fiberglass Cb Antenna Is now only available in the 4 foot length. The Wilson 5000 trunk mount Cb antenna simply clips onto the trunk lip behind the window. 18' coax included. This Wilson Cb antenna can also be clipped to the hood or other locations but this may look a bit awkward. The coax drops into the trunk through the crack and is the ran through the back seat to the front of the vehicle where the Cb radio is mounted. A low cost SWR meter and 3 foot coax jumper is recommended to set the Wilson antenna with.